P-61A-1 (Serial No 42-5528) "Jap-Batty" of the 6th NFS, Saipan, 1944. P-61A-5 (Serial No 42-5536) "Husslin Hussey" of 422nd NFS, Scorton, 1944. P-61A-5 (Serial No 42-5564) "Jukin Judy" of 422nd NFS, Scorton, 1944. P-61B-1 (Serial No 42-39468) "Moonlight Serenade" of 550th NFS, Morotai, 1944. 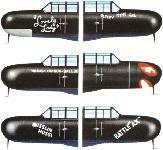 P-61B-15 (Serial No 42-39713) "Lady in the Dark" of 548th NFS, Ryukyu, August 1945. The second YP-61 (41-18877) after delivery to the AAF with reinforced barbette and inboard guns removed. A P-61A-1 (42-5508) retaining the four-gun dorsal barbette. This, the twenty-third production "Widow", was among the first to reach the Pacific Theatre of Operations. One of the thirty-five P-61A-5s (42-5544) after arrival in the UK in 1944. 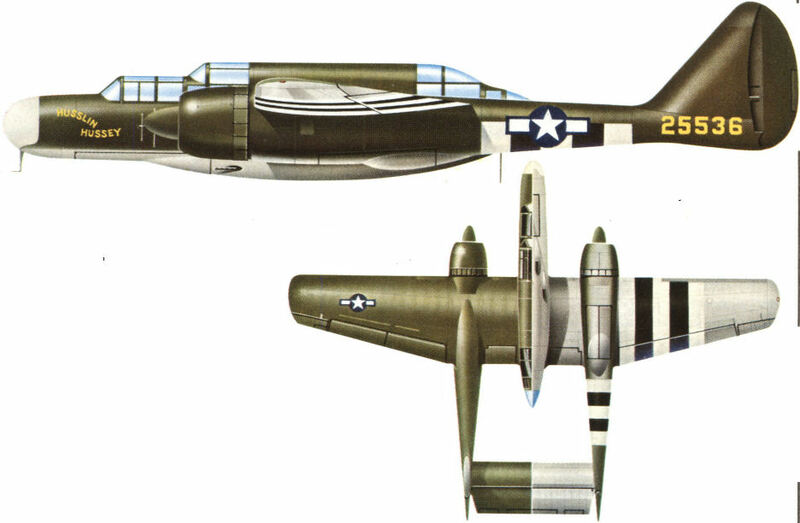 This early P-61B-1 (42-39419) was unusual in having the dorsal gun barbette which was not generally reintroduced until the appearance of the P-61B-15. 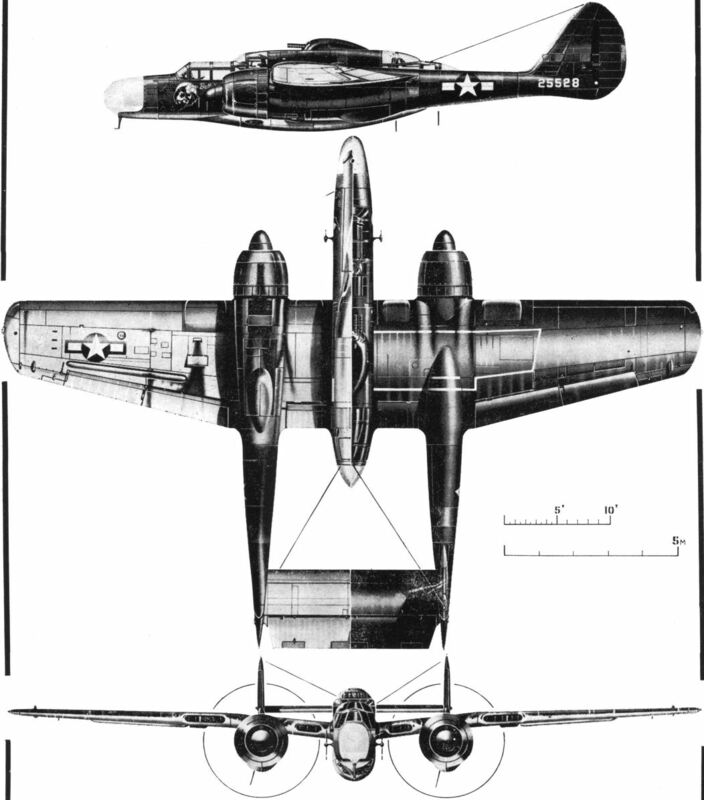 The forteenth production P-61C-1 (43-8334). Note the broad-chord high-activity airscrew blades, the cheek-type carburettor air intakes and ventral turbo-supercharger air intakes. All nose details from 9th Air Force P-61As (based Britain and/or Normandy, summer/autumn, 1944, and featuring invasion striping as per 42-5564) with exception of nose illustrated in the centre of the righthand column, this belonging to a P-61B-1 (Serial No 42-39405) of the 6th NFS at Kagman Field, Saipan, 1944. This particular machine was fitted with a dorsal barbette.